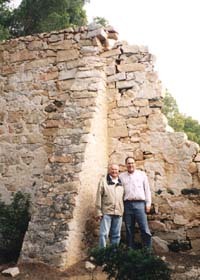 After leaving NSW, James Webber became a wealthy merchant who travelled widely in Europe and America and eventually settled on a remote island in Sardinia. Details are sketchy about James Webber's life between 1836 and 1850. He was a successful merchant based on the continent, probably in Italy, with another residence in London. It is believed he imported fabrics and textiles from China and sold them throughout the world. About 1850, in ill health and needing rest, he arrived at La Maddalena, a remote island in the north of Sardinia. He found the climate suited his health and began to purchase land, eventually owning about six per cent of the island. In 1855 he began to construct a magnificent villa, details of which are on the next page . In 1857 James Webber was appointed British Vice Consul for La Maddalena, a diplomatic post he held for only 12 months. 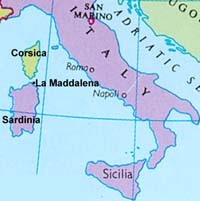 Above right: map showing the island of La Maddalena to the north of Sardinia. The love of agriculture which Webber demonstrated at Tocal was again clearly evident at Villa Webber. He establised a vineyard and made red and white wines of excellent quality. He imported soil by ship from mainland Sardinia and built a water storage and irrigation system to establish a citrus orchard on the dry, windswept island. Right: the massive buttressed walls of Webber's orangery, built to protect the orchard from winds. Pictured left to right are Mr Alberto Sega of La Maddalena who undertook the Sardinian research on James Webber, and Mr Cameron Archer, Principal of Tocal College. James Webber's love of books was evident at La Maddalena just as it had been at Tocal. After selling his extensive library in Sydney before leaving NSW, he rebuilt his library on La Maddalena and his collection was later described as 'legendary'. Below: travellers to La Maddalena get a clear view of Villa Webber as they approach the island on the ferry from the mainland (photo Cameron Archer).